Do you wish you could sprinkle on some kid magic to help your child learn more easily? For many children, the magic is already there – but trapped by a visual system that isn’t in full play. Experts believe that up to 80% of learning is visual. Although basic vision exams may find your child has “perfect” 20/20 eyesight, they may overlook problems such as how well the eyes work together or whether the brain can make sense of what it sees. And educational methods often overlook these glitches. That’s where vision therapy can help. If you suspect a vision-related learning or vision perception problem, have a developmental optometrist evaluate your child’s vision. In the Denver-metro area, contact Dr. Hellerstein’s practice. Kids with 20/20 vision can still have vision problems. What is vision therapy – and how can it help? Vision therapy is like physical therapy for the eyes and brain. Through exercises with a therapist and home practice, problems in the eye-brain-motor connection, such as how well the eyes work together, can improve. For example, a child who has difficulty reading may not “see” differences in letter shapes but can learn to do so. 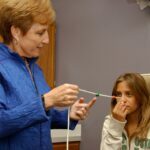 Vision therapy produces wonderful, life-changing results for many kids! The #1 handicap of American kids? Vision disorders. What’s the visual brain — and how can you train it? Even if your child doesn’t have a vision-related learning or vision perception problem, ordinary educational methods may not leverage her richest learning asset, the visual brain. Our brains devote a huge amount to vision, much more than other senses. With high-tech imaging, we can peak inside a brain to see just how visually dominant it is. The brain does more than receive patterns of light through our eyes. The brain creates vision. But first, the brain must learn to see, like an editor, picking out what is meaningful. With remarkable plasticity, the brain can “rewire” in response to training like vision therapy. For young brains especially, the potential improvement is huge. Experience visual brain training! Up to 80% of learning is visual. So… how can I use this to help kids? Give any child a leg up at home, in the classroom, or on the playing field by using learning strategies that train the visual brain. For example, if your child struggles with reading, Dr. Hellerstein’s SEE IT. SAY IT. DO IT!® exercises can help rewire the brain to differentiate the shapes of letters, if that’s the problem. This is a learned visual brain skill. 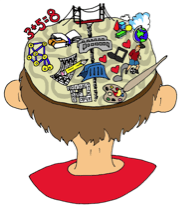 Dr. Hellerstein’s vision brain training can help with math, spelling, confidence, performance anxiety — even creative writing. Another powerful way to train the visual brain is through visualization. More than 15 visual skills are required for learning and reading. Do you see mental pictures when you read? To many of us, visualizing is a natural part of many life skills. But visualization may not come naturally to kids with vision problems. Elite athletes and business leaders use visualization to excel… and kids can, too! It’s powerful and fun. By teaching children to visualize, we unlock a powerful tool for learning almost anything — academics, music, sports — and for making confidence skyrocket. Learn how with Dr. Hellerstein’s pioneering SEE IT. SAY IT. DO IT!® process. To make kid magic for your child, start by addressing vision problems. Next, transform learning by using Dr. Hellerstein’s strategies for visualization — the SEE IT. SAY IT. DO IT!® process — and you’ve got a powerful formula for success. It works magic on adults, too. Dr. Hellerstein developed her approach over decades of helping kids solve learning problems. The results are happier, more confident kids with success strategies for life. More recently, she has brought her techniques to sports performance for kids or adults, with equally powerful results. One in four school-age children have vision difficulties. Don’t know anything about vision or the brain? No worries! Dr. Hellerstein’s solutions are for the parent or educator who wants simple steps TODAY to help kids learn more easily and succeed. Some techniques are progressive, while many target specific problems, such as how to remember math facts, schedule homework, or keep an eye on the ball. Get your copy of the SEE IT. SAY IT. DO IT! Action Guide now. Is your child missing out on the achievement and joy of learning? For athletes, Dr. Hellerstein has pulled her sports vision and visualization techniques into a handbook that you can pop into your sports bag and take to the gym or field. Whatever your game, 50 Tips to Improve Your Sports can help kids, weekend warriors or elite athletes go from good to great.